The development of the cemetery is deeply rooted in the church, the University, and the larger local community originally settled as Stony Brook in 1681, renamed Princeton in 1724, and incorporated by the state in 1813. The oldest part, formerly known as the Old Graveyard, lies at the intersection of Wiggins and Witherspoon streets. Here one can see some of the earliest European family names in the area: Bayard, Berrien, Leonard, Mershon, Skillman, Stockton, and Terhune. This original one-acre parcel of land had been acquired by the College of New Jersey, now Princeton University, in 1757 from Judge Thomas Leonard, a member of the Provincial Council, a year after the College with its seventy students had been moved from Newark to Princeton upon completion of Nassau Hall, still the University’s main building. 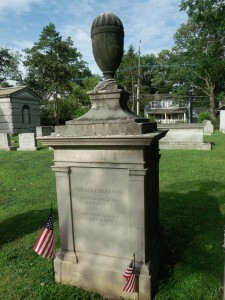 The oldest surviving monument in the graveyard is that of Aaron Burr, Sr., the second President of the College of New Jersey, who died in 1757. The predecessor of the Nassau Presbyterian Church was established in 1762 and completed in 1764 with a grant of land as well as substantial financial assistance from the College. The Church property included a burial ground that was later returned to the College in exchange for the school’s cemetery. In 1801, Dr. Thomas Wiggins bequeathed to the Church his farm which was adjacent to the cemetery. The Church eventually sold the farm but retained three acres for the graveyard’s expansion. Later gifts of over four acres from Paul Tulane and eight acres from Moses Taylor Pyne led to the present-day size of almost nineteen acres. The graves of all but four of the deceased presidents of the College of New Jersey later renamed Princeton University can be found in the Presidents Plot located in the Old Graveyard section. Also buried in the cemetery are all but one of the deceased presidents of Princeton Theological Seminary. Within the second set of cemetery gates in the area known as the Witherspoon Jackson Community, is what was originally designated as the Colored Cemetery, established in 1807. It is the section of the cemetery where generations of African American families and noted residents are buried. The cemetery continues to evolve and today, besides traditional interments, offers options including the burial of ashes in biodegradable earthen urns in the Pardee Memorial Garden. We encourage you to enjoy the Princeton Cemetery. Upon arriving through the main gates there is a brochure available to lead you to some of the more distinguished graves among the thousands of people buried here. If you would like more information about those interred in our cemetery, view the Interment Records.